Many readers have requested information about restaurants that are a consistent favorite in the city. Below is a list of three and, well, one that is more a theater for food and performance. It is true that my tastes tend toward the traditional Tuscan dinner, served by family who have a great deal of ownership in a diner’s satisfaction, care deeply about the freshness and authenticity of their recipes and want you (us) to come back for more. Hope that you will give these a try next time you are in Florence! Only restaurants in Italy with more than 100 years of hospitality service are eligible so this is truly an honor for the Baudone family. In the over fifteen years that I have dined at Bibe, never has there been a disappointment. Truly a Tuscan – a Florentine – treasure! Your trip into the into the nearby Florentine suburb of Galluzzo, by taxi, will cost you about €20.00 each way and you will have a memorable meal, perfectly prepared and graciously served. This fourth generation family run restaurant attracts local Florentines as well as the knowledgeable visitor. You may see an occasional large group here, but the main dining room is always reserved for tables of from two to six diners. He cooks up weekend brunch, lunch and dinner, culminating at 9:30PM in a live performance of drama, music or comedy arranged by his wife, artistic director and comic actress Maria Cassi. Dinners are hectic: grab a chair, serve yourself water, wine and antipasti and wait for the chef to yell out what’s about to be served. You line up at the open kitchen’s counter for your first and second course. Dessert and coffee are laid out buffet-style just prior to the performance. FUN! Atop a hill to the north of the city of Florence, largely ignored by most visitors to the city, is the Convent of San Francesco. Below that gorgeous renaissance building is the heart of Fiesole, a little known jewel and the birthplace of modern day Florence. The village was founded by the Etruscans. When the Roman’s conquered the village in the third century BC, they named it Faesulae, hence its modern name. 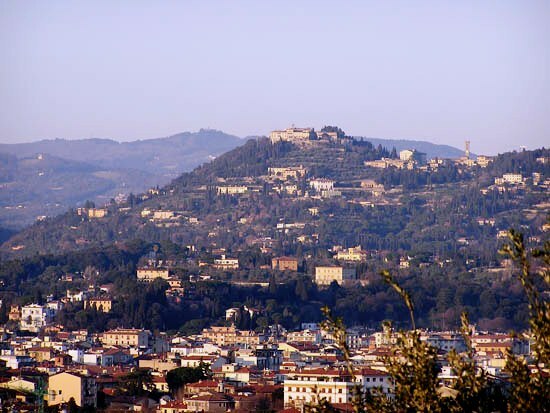 The earliest inhabitants of Florentia, modern day Florence, came from Fiesole. What most visitors don’t realize is that within a few minutes bus ride from the center of Florence is one of the best archaeological sites in Tuscany. The Archaeological site includes remains of the Roman temple (built on the foundations of the Etruscan’s temple), a well restored Roman bath complex and an amphitheater capable of holding up to 2000 spectators. Beyond the relics in the Etruscan Museum, located on the grounds of the archaeological site, is the Museo Bandini, which offers an amazing collection of 14th to 14th Century works by artists like Taddeo gaddi and Lorenzeo Monaco. The ticket for the archaeological site includes admission to this museum. There are not many walks in the are of Florence that offer more spectacular views of the city than the Via San Francesco, which leads from the main town square UP the hill to the convent of the same name. If the timing is right, stop by the Erta del Mangia, a lovely restaurant on your right as you climb above the town. The restaurant offers a quiet garden and fairly priced meals. The chapel at the Monastery of San Francesco, sited on what once was the Acropolis of the Etruscans, contains a spectacular early Renaissance altarpiece. 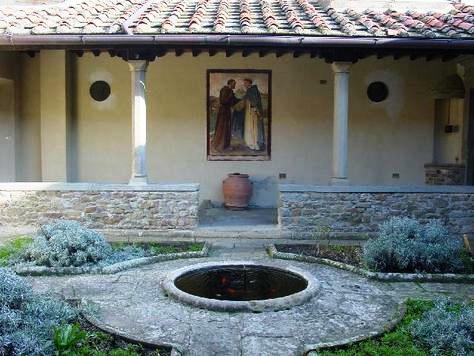 The quiet inner courtyard offers a sense of the peaceful seclusion found by the monks who once inhabited the buildings. 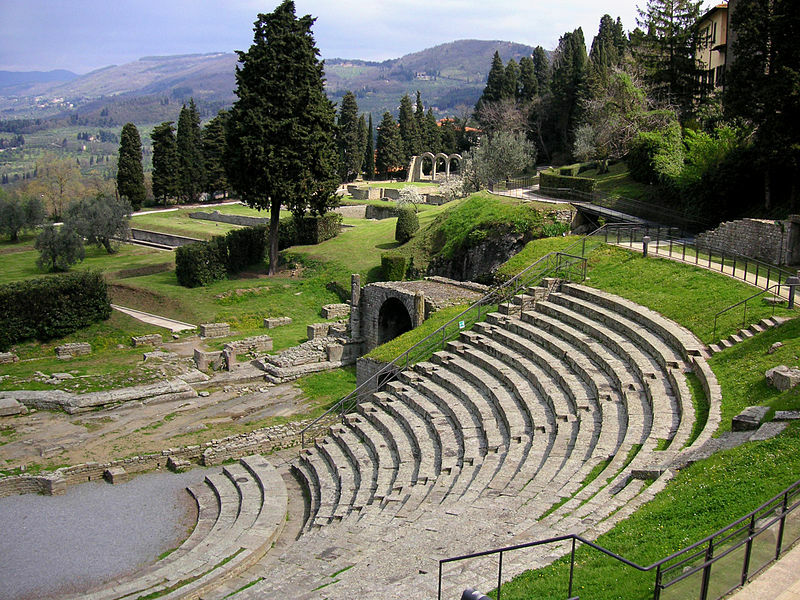 Fiesole is truly a little-known jewel above the city. Include a visit when you are in the area and you will not be disappointed. Some additional details and restaurant recommendations are listed below. The Number 21 bus leaves from Santa Maria Novella Station on a regular basis. Fares run Euro 3.50 each way for the trip to the main piazza in Fiesole. Easy access to all the sites mentioned in this post from this bus stop. Open: 9,30am- 7pm (summer) and 9.30am-5pm (winter). Closed on Tuesdays only during the winter. Monastery of Saint Francis: May-Sep 10am-12 noon and 3pm-6pm; Sat, Sun and holidays 3pm-6pm; rest of the year 10am-12 noon and 3pm-5pm; Sat, Sun and hols 3pm-5pm. Closed on Mondays. Perseus: On the square in the village. Excellent Tuscan menu, authentic preparations. Beefsteak Florentine? This place is famous for its preparation. Italian’s eat here. Not much more to say. Hotel Villa Aurora: The entrance to this unassuming three stay hotel is directly off the main square in the village. They offer lovely clean rooms for a fraction of Florence’s costs – the views from the rooms facing west are unforgettable. There is a large terrace for drinks and meals – owned by another business, yet directly next to the hotel. Good value.